Once again, Microsoft has unleashed a two-fer upon the Xbox Live members out there (you and me). This time bringing Capcom's Flock! 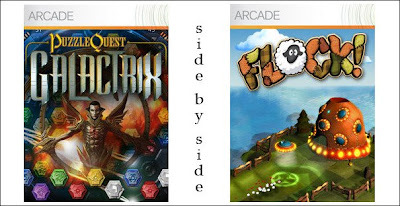 and Puzzle Quest: Galactrix to the online service. At the very least, you should check out the demo's - they're free silly! We're hoping to have reviews of the games, but are currently waiting review copies. Support your local UFO union and check them out. Oh, and by the way, if you want - you can always purchase them on Amazon, right guys?